Thanks to Kris and a generous farmer we are in the midst of processing and distributing carrots to food pantries, friends, and others. What do you do with a literal ton of carrots? Six of us from our Free School harvested a ton in less than 2 hours. Many of the carrots were over one pound and several weighed in at close to three pounds. The first thing we did is eat them raw. They’re deliciously sweet. We had a good laugh when one of the students opened his lunch box out in the field full of carrots to discover his mom had packed him....... carrot sticks. When we got home Mitch helped me (John) use our rain water collecting bin and barrel two wash the carrots. We managed to get about 800 pounds washed. We then cooked up a batch for an early thanksgiving dinner on Tuesday. Talk about fresh. Six hours from field to fork. When you live a life with one foot off the grid and the other balancing precariously in entrepreneur land you can find yourself running a rather challenging yet exciting scooter on life’s road. The balancing act is sometimes more like a fumbling act. And you can be viewed more as the clown in the circus than the “professional” juggler. It may sound like complaining here but really I am just setting you up to see. We have so many opportunities in this ride to crash.....but don’t. On this journey we have been so blessed. Unspoken needs have been met in very creative ways. We have witnessed and experienced the true friendship of others and that there are wonderful, kind people all around. We are thankful. We are thankful for our home and all the many lessons in life we have had the opportunity to learn. The key to financial security and living free is living smart. It’s not about depriving yourself. It’s about being smarter about things you buy or do anyway every day. Smart living can mean the difference between living free and just struggling along in life. In times of economic and political uncertainty, smart spending is even more important. Smart living is about making good decisions when saying yes. It’s not always about spending less, but about getting more value from what you are already spending. Something you can do today! Get quality prescription glasses for as low as $20 at the following web sites. Clark Howard my favorite financial radio talk show host has been getting his glasses online for years. I highly recommend listening to his radio show. Go to www.clarkhoward.com to find when he’s on your local radio station. As I have stated many times in my books and workshops, a family is really a small business. Most families will bring in a million dollars or more in their life time. 1. Is the business worth anything? In the business world this is called a balance sheet. The balance sheet tells you how much the business is worth (equity). Or in the case of an individual how wealthy they are. The formula for this is--- Assets - Liability= Equity. Assets are everything you own such as house, cars, recreation vehicles, savings, retirement money, cash, and anything else of value. Liabilities are everything you owe on your house, car, credit cards, loans, etc. Your Equity (or net worth) is how much money you would have if you cashed everything out and paid all your debts. This is calculated by subtracting all your liabilities from all your assets. This is what you have to show for your life and all your years of work. Most of us have heard the term feral cats. Domestic cats that have gone wild. Feral fruit is domestic fruit that is growing wild or unattended in people’s yards. In my edible and medicinal herb walks I would call our finds wild fruit. I found most people were thinking that to get this wild food they would have to venture into the wilderness. The majority of my wild food foraging is around urban areas and by volume most of that is feral fruit. Apples are the main feral fruit we collect. They are everywhere in our area. Anytime I’m out driving around I keep a watch for them. I have been doing this for 30 years and can spot an apple tree with or without apples from a long way off. 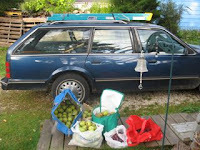 It’s not unusual to collect a thousand pounds or more to make cider, jam, apple butter, dried apples, and to eat fresh. They are available from August to October depending on the variety. Last year I pressed over a hundred gallons of cider all from feral fruit. Money is Only Good for one Thing! Spending! That is why we suggest that you look beyond money to find happiness, fulfillment and meaning in life. We spend money in three time frames. Present: The key to building wealth has always been the same. Spend less than you earn today. To do that without depriving yourself means that each and every day you must spend your money smarter. Past: Is paying for things purchased in the past. In other words debt! Debt can be a great cause of stress. Is the original purchase worth it? Future: Monetary saving and investing is not different from spending. It’s just deciding to spend in the future. If you save today, in your future “today” you will save more. The power of cutting expenses is that it builds wealth and works in the past, present, and future time frame.